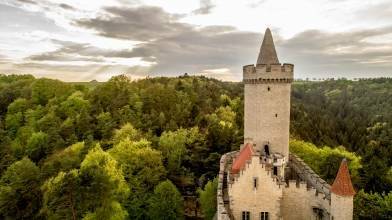 Contributor and drone pilot Ludoweet created this amazing drone video of Kokořín Castle in the Central Bohemia region of the Czech Republic. Located about 10 km (6 mi) northeast of Mělník, it was built in the first half of the 14th century and heavily damaged during the Hussite Wars which raged through Czech lands in the 15th century. It was partially reconstructed early in the 20th century. Since 2001, the castle is now a protected site under Czech conservation laws. Description: Kokořín Castle is a castle located some 10 km (6 mi) northeast of Mělník, Czech Republic.It was built in the first half of the 14th century. It was heavily damaged during the Hussite Wars and stood in ruins until the reconstruction campaign of 1911–1918. It was nationalized in 1948 and has been designated a national cultural landmark since 2001.